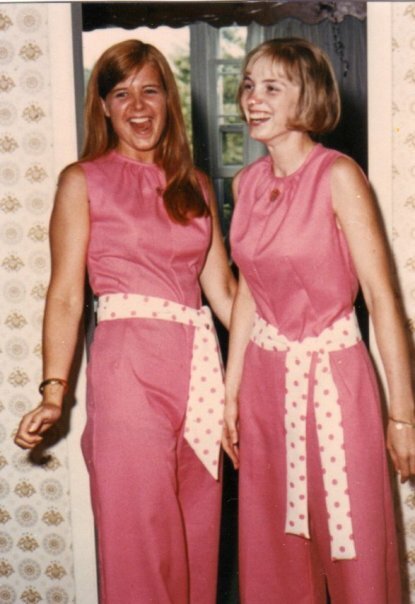 Vintage Babs (left) and her sister in handmade threads. What do you get for the woman who has everything? It’s an age-old question. But really. What do you get for the woman who has everything? She already has me, for chipmunk’s sake. I asked myself this question time and time again over the past few weeks. My mom, Babs, is a very special, thoughtful lady, so not just any present would do for Mother’s Day. I could design a custom wine label, draw a picture of Bella and Edward, get tickets to see Daniel Radcliffe naked on Broadway, but, been there, done that. …and who doesn’t love haikus?! This entire blog has been a build-up to the grand poobah of all haikus, really. For two daughters who like clothes. Us much more than dough. Was it worth it, Babs? 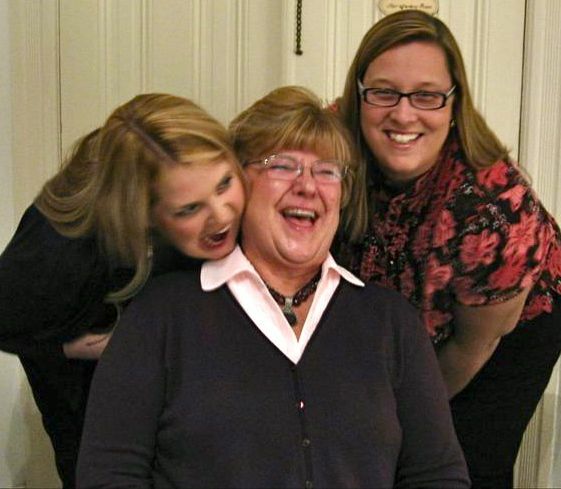 I’d also like to wish a very Happy Mother’s Day to my wonderful mother-in-law and my sisters (both in blood and in law)! And to YOU, ‘o course! This includes moms of pets. Don’t let anyone tell you us it’s not EXACTLY like having real kids. In Babs’s honor: Is there a store you’d die to get to? Previous postSlap Bracelets Comeback – Part 5! Next postBeing Sick is No Laughing Matter. Okay. It Totally Is. Ah Babs. A haiku reply! Brilliant. No wonder I turned out so awesome. Either my posts aren’t showing up on some people’s Reader Lists, and/or comments are spotty, or a whooooole lot of people have simultaneously decided they’re bored with me. Thanks – I’ve gotta agree with you! And this comment came through so I hope that’s a good sign for your commenting on other blogs! Thanks! Babs was a real playa. 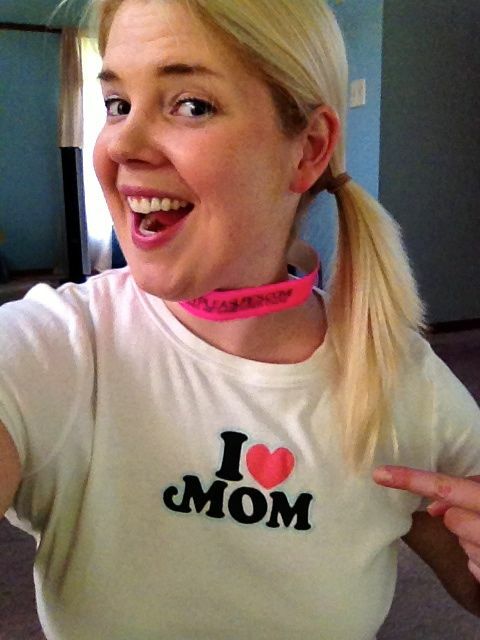 I don’t even want to admit how long I’ve had that t-shirt (from Old Navy), but I wear it every Mother’s Day! Pretty soon I’ll have to just make it into a pillow and put it around my neck or something. Are you still having commenting troubles? Yours seem to be coming through here! Thank YOU! Hope you had a grand one with lots of chocolate…and booze. Susie, your “unless…” has me way too intrigued… I am pondering all kinds of scandalous ends to that sentence. Let’s just say it involves lingerie, stolen money and fast cars. Wow, that photo at the top A) is super cool and B) I didn’t even pause, I just saw it and thought, “Where did Jules get those cool, vintage clothes?” Genetics, right? I don’t think anyone but Babs and her sister could pull off that pantsuit. But I’d sooo be willing to try. So, B-man stole my comment. How amazingly COOL is that top pic? I love it. You are like her mini-me (does that make any sense?) You are very lucky to have such a wonderful mom, Jules. Thanks, Darla! I love that picture, too. Babs is ‘da bomb; I am definitely lucky. btw…did you see k8edid’s blog post yet? It is hysterical. I really hope you write a memoir some day! Thanks for the heads-up – I just dashed over there. AWESOMESAUCE. Boo, I love your blogging community. They have infinitely good taste, wisdom and insight. Thanks again for this ode to Babs – heartfelt, funny, and loving. What more could a(n awesome) mom ask for? Don’t they have amazing taste? I accept this comment, even though this one isn’t in haiku form. Love you!! Hee! I love the haiku, and I love that the store was Pier 1 Imports. That would be my mom’s store, if she were able to answer this post. Deb, I don’t know if you’re really into Twilight like yours truly, but I have to say the Twilight store in Forks, Washington is one of the coolest stores I’ve ever been in. They went ALL out (they made it look like a forest inside); plus I think the contrast between that store and the rest of the tiny, old-fashioned, one-stoplight town made it all the more special. It wasn’t like just another Lego or Disney-mania type store in Times Square. This was AWESOME. I love the accompanying photo. Oh, and I loved the old photo of your mom, too — what a babe! Babs the Babe! It’s catchy, isn’t it? I would nearly kill myself to get to Banana Republic when their clearance rack is 40% off. By the way, that metal fork could’ve really killed you (or pedestrian chipmunks) on your way home. Seriously dangerous. I would nearly kill myself, or at least fight a WV gypsy, to get to Sweet Frog, a frozen yogurt place near my house. It features an entire wall of fro-yo dispensers and a bar of toppings. It’s seriously effing awesome! 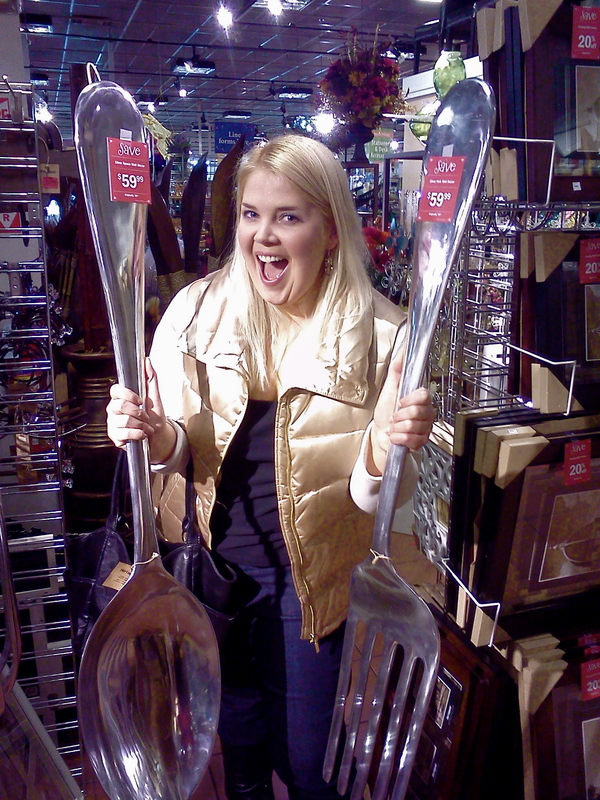 You guys were so ahead of your time – the fork and spoon are in Pier 1 right now! I think you should get the giant spoon and take it on over to Sweet Frog. WV gypsies, outta Sprinkles’ way!! Is it weird that I dream of being in Sweet Frog alone, with nothing but the wall of forzen yogurt and my mouth? Thank you so much, Jessica! I’m so flattered that people think I look like Babs. She was quite the heart-breaker! Why oh why didn’t she keep all of these amazing clothes (not that I’d fit into them, LOL)?! Thank goodness she had you… otherwise I would be stuck reading my own blog all the time. Happy Mother’s Day to Babs! What a lovely tribute from a chipmunk-a-licious daughter. Did my comment etiquette post prompt you to go back through all my comments through history to make sure you replied? Cuz I think you may have missed one back in the Great Comment Disaster of ought-5, and I’m really offended. OOOooohhh, I have a song to look forward to? How about some musical accompaniment by your reggae-master Peppermeister? I can’t wait!! I would totally die/kill to go to Border’s. Especially since they no longer exist. And Barnes and Noble is NOT the same thing, no matter how often they try to bribe me with transferring my rewards card. Screw you, B&N. Awe!! Such a nice post. Also, wordpress is being a douche and not emailing me your new posts. What kind of world do we liive iiiin! The good news is . . . since you are her clone now (hence the pic), you have looking adorable in the future to look forward to!! Huzzah. I somehow missed this post yesterday . . . what’s up with that? Oh, and your last comment was in my spam folder. Why do our blogs hate each other, Jules? Why??? I, um, don’t like to shop. (Ducks from flying objects being hurled at my head). See how desperately I need to be part of your family? Teach me, great ones. You are my only hope . . .
WordPress is trying to make us all insane. Don’t they know we have blogs because we already have so many dang issues to work out?? You need a shopping intervention! I think Babs is already on it. Awww! Happy Mothers Day, Babs! Thanks, JM! And same to you! I hope you got in a little R&R?? I really don’t know why people give me haughty looks when I say that… I mean, it’s not my fault they don’t want to leave their 6-month-old home with a bowl of water and a chew toy while they go to the movies. The photos are awesome, Babs – er, Jules! Swear you look like your Mom. Total mini-me – er, I mean mini-her. Excellent haiku, too. Awesomsauce! Thanks so much, Lenore! I take that as a DEFINITE compliment (being a mini-her)! It is not even right how long I’ve been wanting to get a haiku up in this biz-ness.